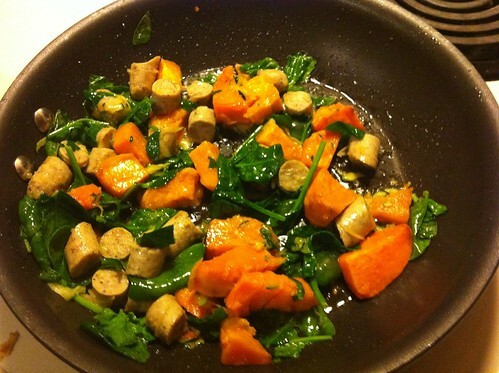 Sausage & Sweet Potato Breakfast | Blog, Jane! Blog! Here is what I eat almost daily. Before I found out I shouldn’t be eating eggs, I was eating this with eggs scrambled on the side. I love sweet potatoes for breakfast. *to roast sweet potato: Preheat oven to 350. Put 1-2 tbsp coconut oil on baking sheet (with sides) and place in the oven while preheating. Peel and cube sweet potato in 1″ pieces. Add cubed sweet potato to pan and roast for 20-25 minutes. Cool and store in refrigerator for up to a week or in the freezer. I normally roast about 2#s of sweet potato on Sunday afternoons for the week. and shred my zucchini then too.